Only perfect injection handling gives reproducible results. The PAL LSI is designed for the precise and accurate handling of liquid samples of up to 100 μL in volume. In combination with the PAL Sample Control software all parameters of aspirating and dispensing of liquid samples can be fully controlled. This is crucial for perfect injections. A range of syringes from 1.2 μL to 100 μL is available. In the example highlighted above an aliquot of an internal standard is sandwiched between transport solvent and the sample. Air gaps in between the liquids preclude mixing of the different liquids. The accurate control of these steps is the basis of reproducible methods. 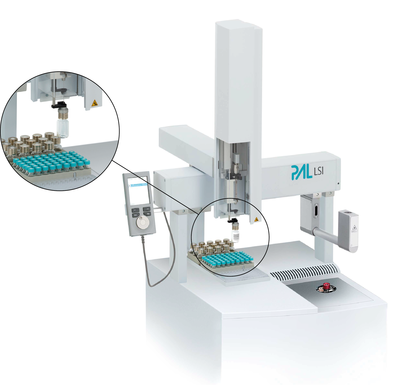 The PAL LSI is a robot that can reach any three dimensional position within its working space and is ideally suited to pick and place objects like vials. It can inject from several sample containers into different detectors or transport vials from a tray to a temperature controlled stack. The PAL RTC / RSI / LSI are available through a global network of Value Added Resellers (VAR).